Whatever style of living space, window becomes one of important elements you notice. The way you treat the windows will create the ambiance that enhances your particular taste and style. There are so many ideas of window curtain design which have inspired many people, especially those who love windows and their accessories. One of the most favorite design is half curtains. If you are interested in these window curtains and want to take a look at, please feel free to visit our gallery bellow. We hope some of them will help you to get a new inspiration. Cafe curtains are also called tier curtains. This kind of curtain gives us a little bit of privacy while it allows us to get partial lights from outside, as this curtain is hung in half part of the window. Such curtain is commonly found in traditional-style houses, especially those which are equipped with wooden-framed window. Half window curtains in light grey – this curtain is perfect combination for the bathroom designed in semi traditional style. The color is able to stand the bathroom elements out. 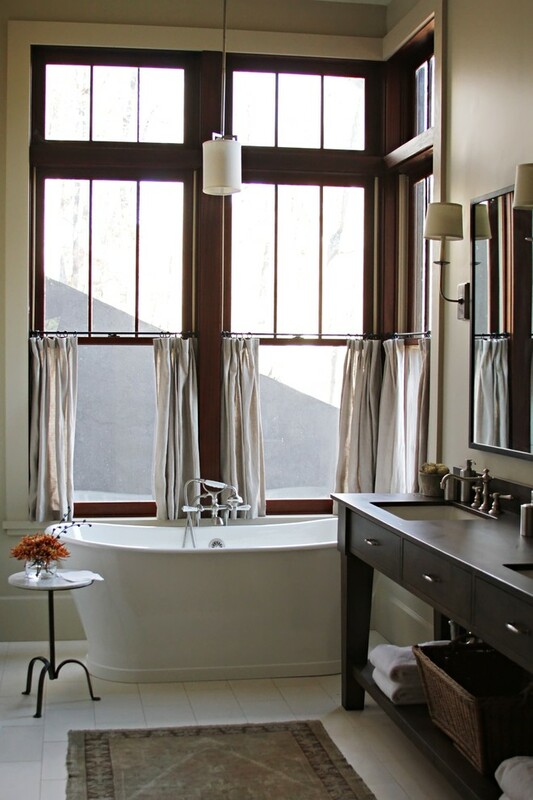 Take a look at tub and ceramic floors; both have close similar color tone to those curtains. It looks more gorgeous after the owner adds dark-finishing vanity and mirror. All is a perfect application. The curtains give a different accent to this bathroom. 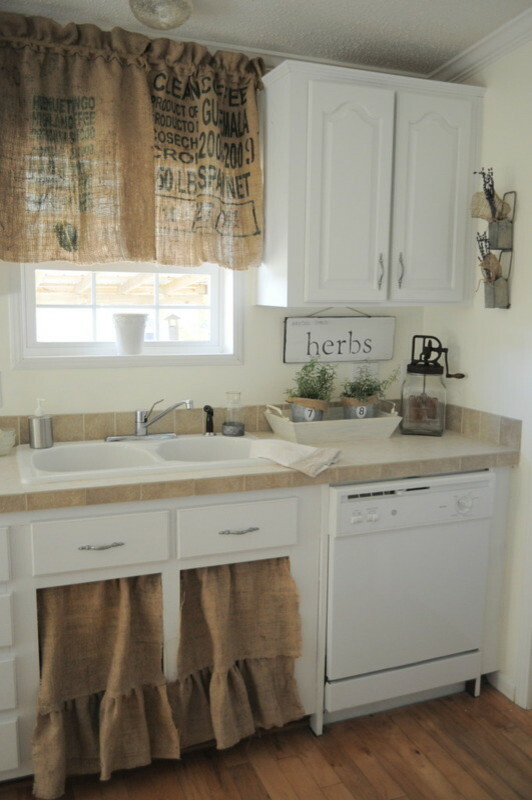 The curtains also have similar color scheme to dried-root rug. 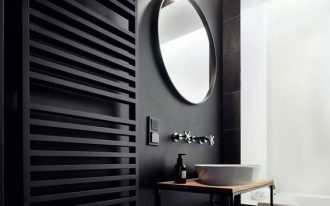 Both are in earthy brown color, providing the balanced elements for other bathroom properties like tub, walls, and stationary which have white and light beige color schemes. There are many interior elements in this classic-formal living room. Among these elements, there is an element that’s successfully attracts us. The narrow windows have been covered with white shutters and half curtains as well. Such installation, of course, is seldom to find. Cafe curtains or tier curtains can not only be used for dining room or kitchen, but they can also be used for other rooms, including bathroom. 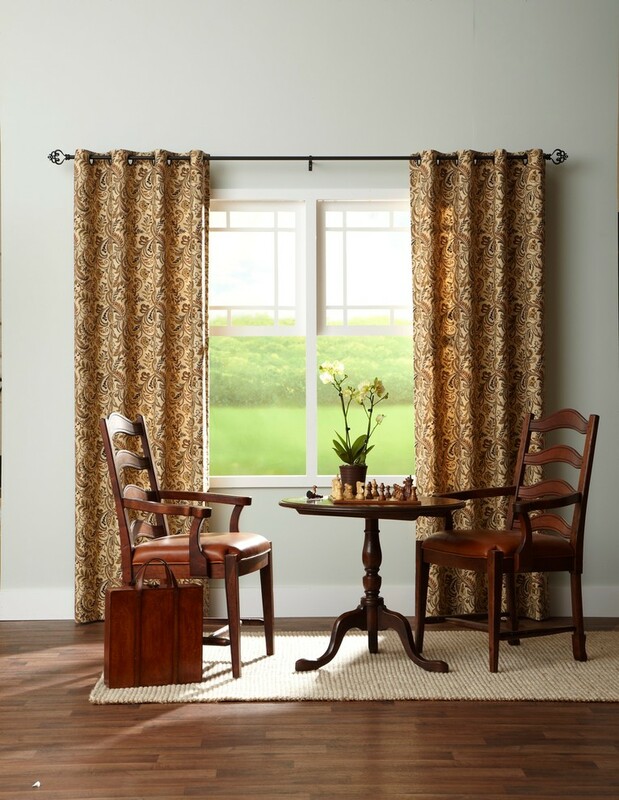 These cafe curtains are made from light and lacey fabric, and they have spring rods at the top and bottom. Such curtains let us to provide sufficient natural lights we need and some neighbors’ view without distracting our privacy. This room is so fantastic and elegant. 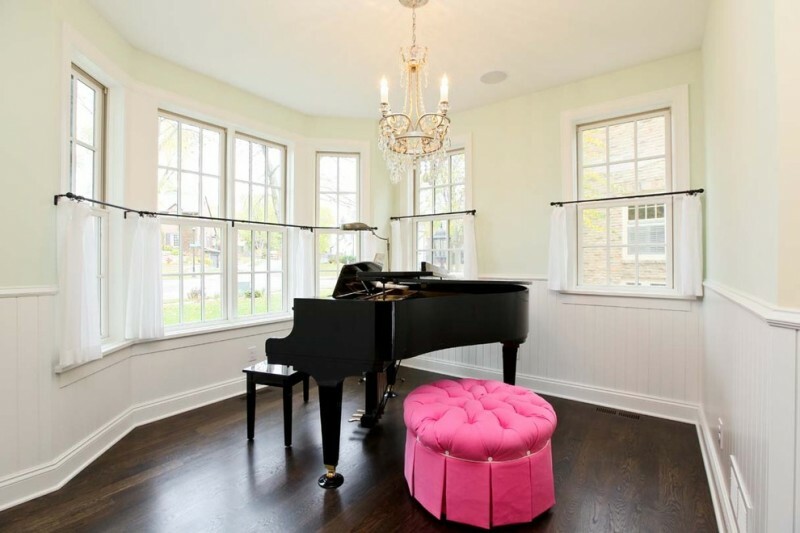 The room is furnished with sweet pink Ottoman chair which is used when playing piano. Pure white cafe curtains are installed to provide double functions: natural light and privacy providers. With these curtains, we’re possible to enjoy the beautiful views outside. 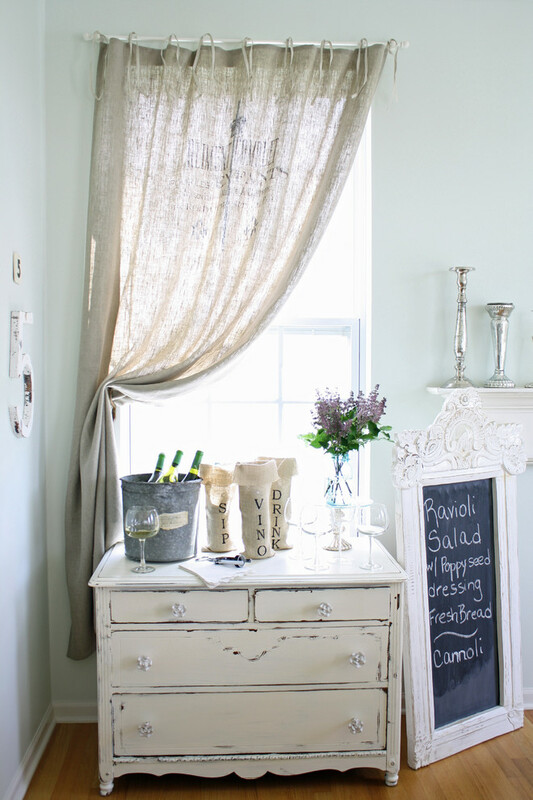 This shabby & chic sun room looks so cozy. The owner puts the neutral tones, numerous textures and finishes, and also some furnishings in different model. 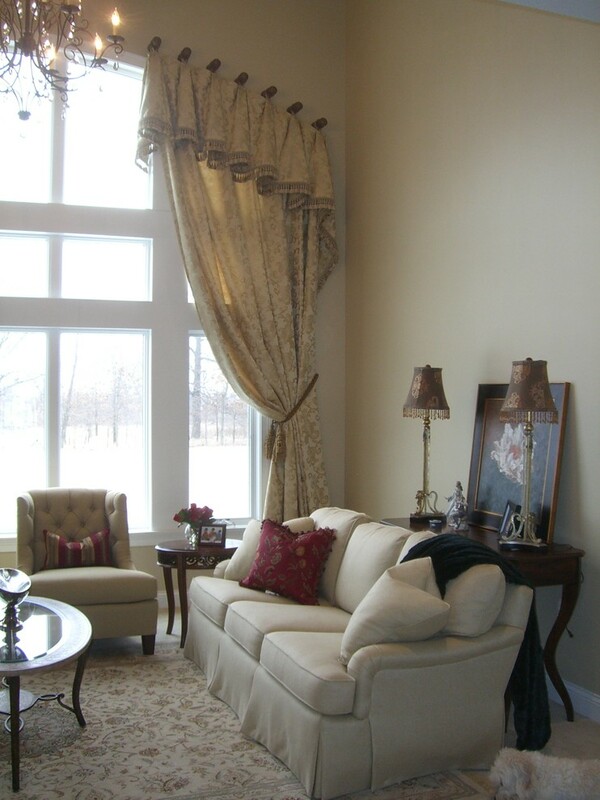 The owner also installs the elegant white tier curtains as she likes clean and pure white window treatment. Like the main theme, this sun room is designed in colorful schemes. Each interior item has different color schemes. 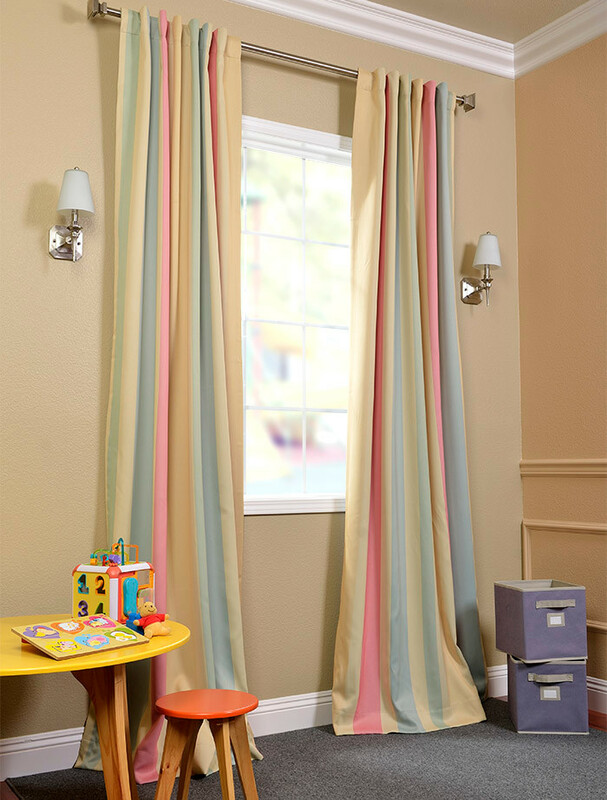 Full-length half window curtains, for instance, display multi-color motifs. Such scheme choice makes this room full much more color schemes. To make it softer, the designer features the windows with white tier curtains as the additional window accessories. 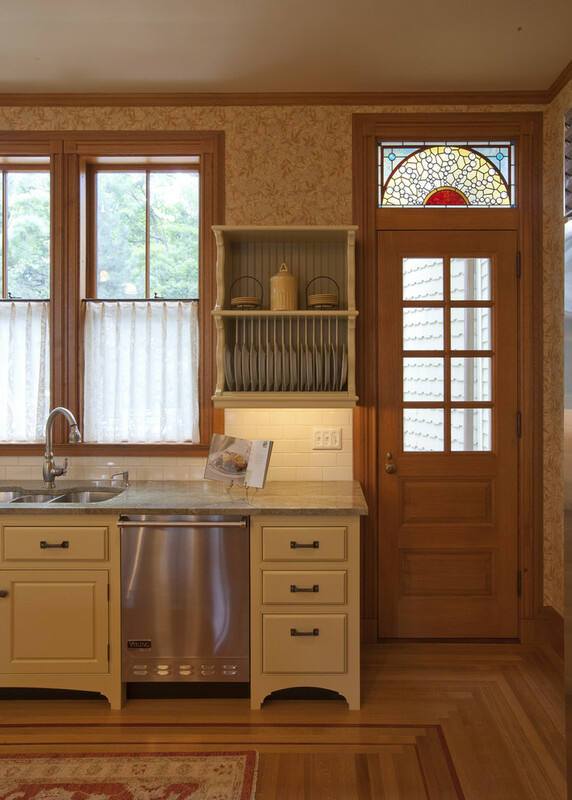 These green half window curtains with motifs are installed to give a special accent in the kitchen. They are so striking when they are compared to other interior elements. Coastal-theme living room with lots of comfortable seating, including some reclining chairs with accent pillows. It feels cozier after the room has been installed the window curtains. The curtains are just applied in half way and garnished with multi-colored strip motifs, giving the ultimately luxurious look. What are you thinking about this room? That’s right, it’s plenty of color schemes. Green half window curtains, for instance, shows unique design and motif. Even though these elements are set in different colors, they’re well-balanced. 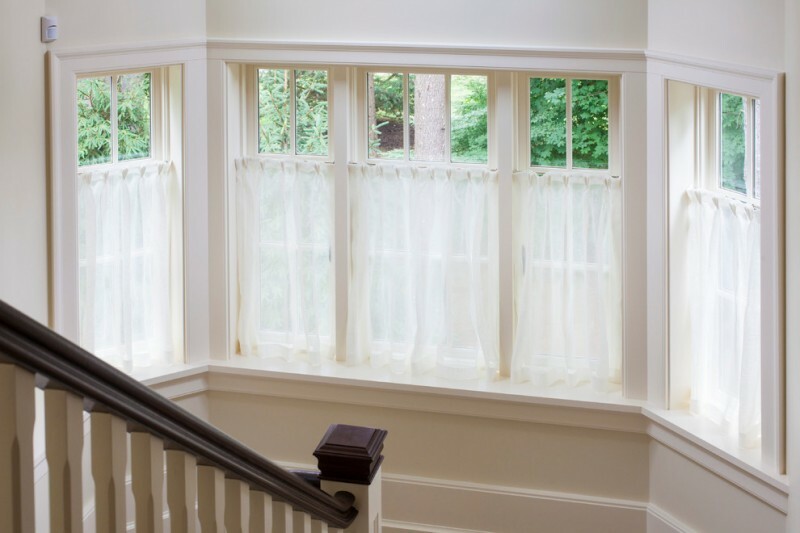 Complete your glass windows with white window sheers. These sheers are made of hand-sewn thin linen. They are attached by hidden pocket metal rods which are mounted on each individual window frame. Like other common half window treatments, these window sheers are hung to add privacy and to control natural lights in stairway area. Feel lots of elegance and luxury of powder room in Mediterranean style. 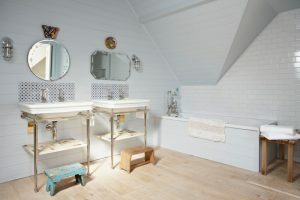 The room is dominated by soft beige tone, reflected on vanity, walls, and small items. 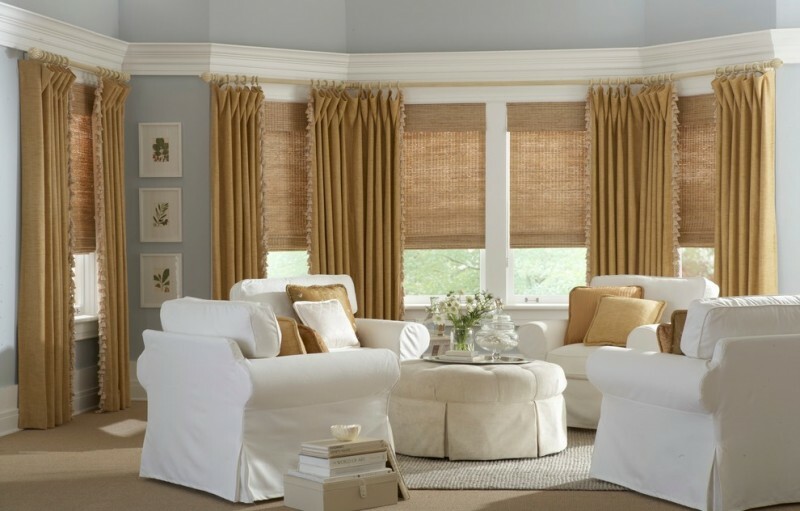 White window sheers featuring gold-toned rods adds more the aesthetic value in this room. Bedroom is really identical with privacy. 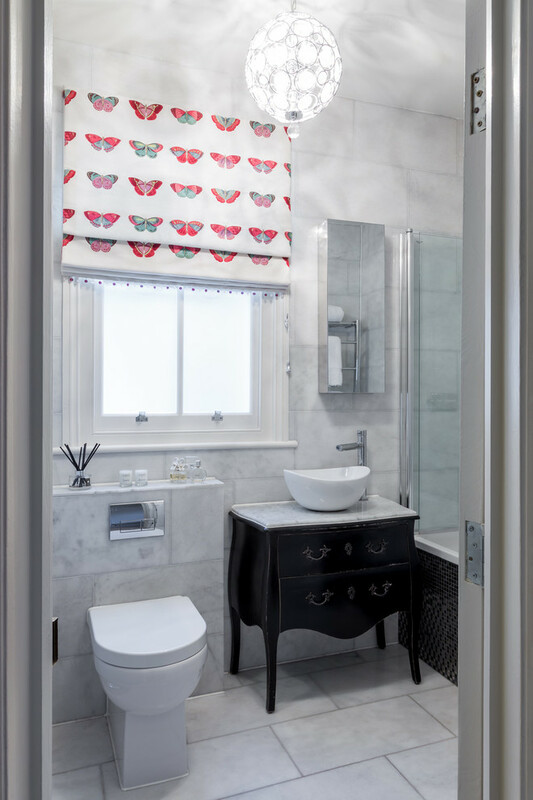 To add more privacy, this room is commonly designed with privacy supporting elements like window curtains. 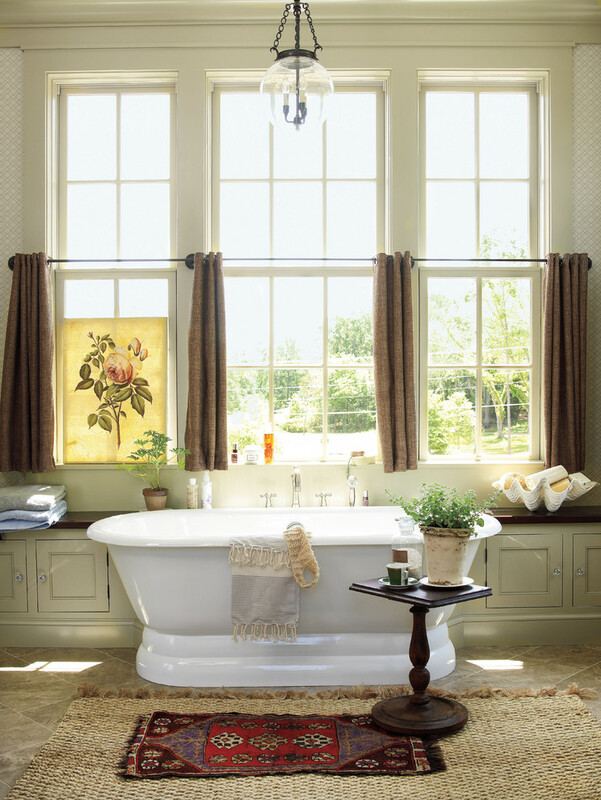 Like this picture, the designer chooses floor-to-ceiling window curtains to give much more privacy. These curtains are supported by black metal rods which have been mounted on ceilings. 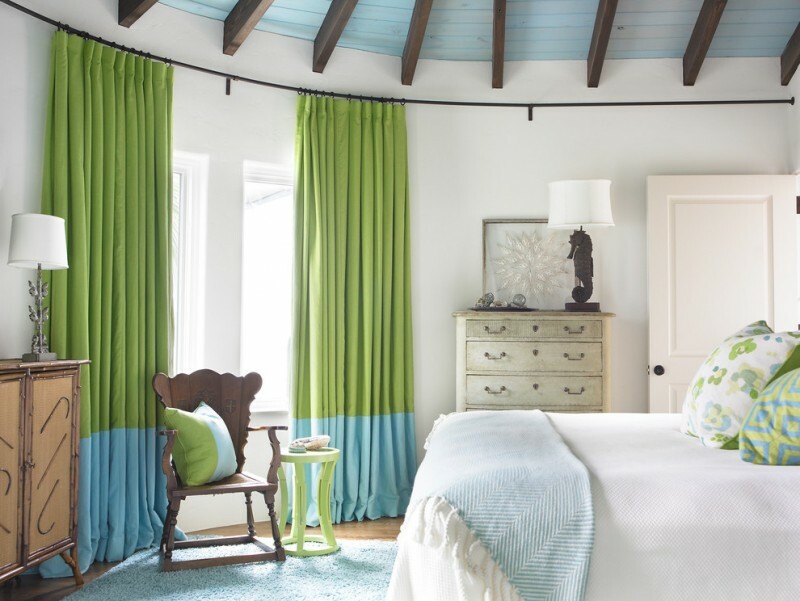 Green-blue colors here are intentionally applied on curtains in order to fit room’s main color theme. At glance, these window curtains are so unique and fantastic. The curtains are produced in Ambrosia stripe motifs, as tasty as the real Ambrosia. Green, blue, pink, and yellow become the colors inserted on curtains. 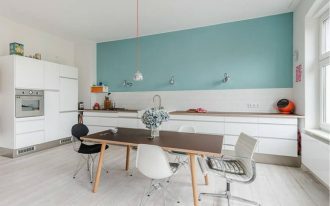 These colors are good to combine with neutral beige on walls and grey on floors. Dark choco half window curtains hung on black wrought iron rods add aesthetic value in this room. Moreover, their color looks so matched with other interior furnishing items. 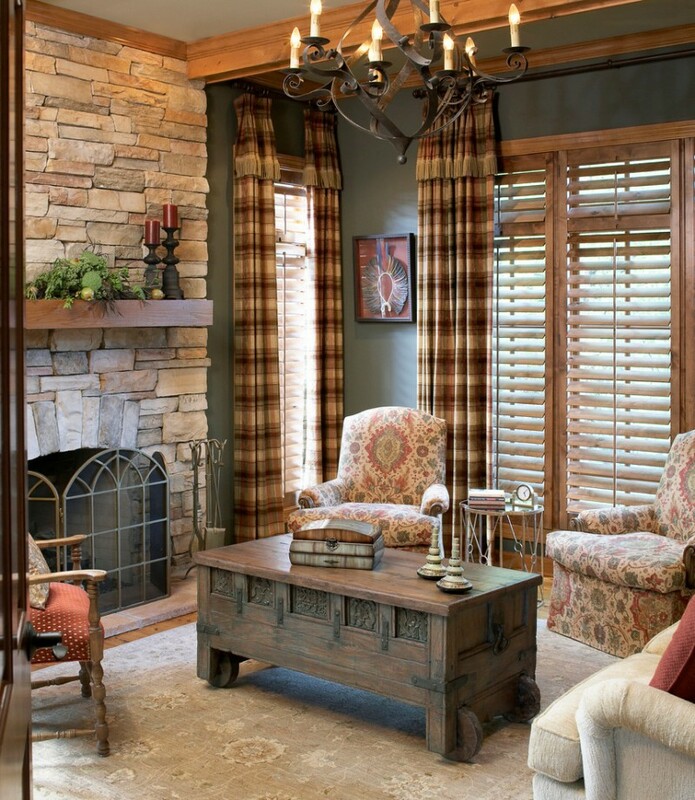 The result, this combination creates warm and cozy nuance, representing the real family room. 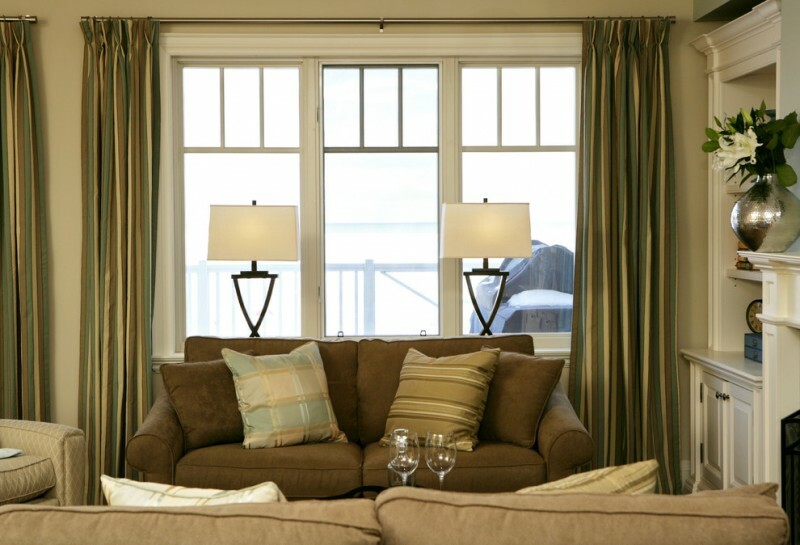 There are two layers of window treatments: light beige half curtains and pull-down window shade. Both are made in different tone and detail. The window shade here is aimed at providing privacy, whereas the half window curtains are just the accent for the window. This means both have different function but balance each other. Bamboos-made window curtains are also interesting to apply. Like this one; the owner uses dark choco half window curtains that can be roll up and down based on needs. The color scheme, of course, is contrast to other interior elements. The window curtains can be customized based on the season. 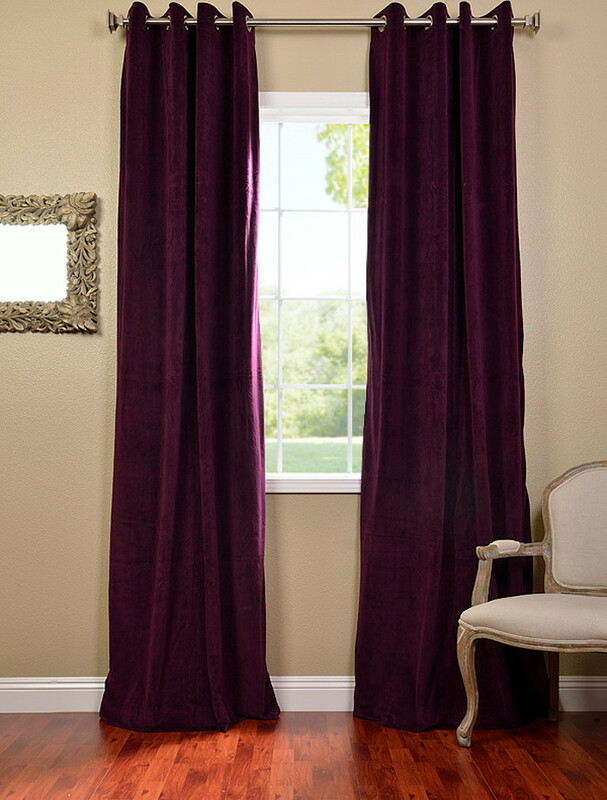 These eggplant-toned window curtains can be added to create a gorgeous accent, especially the purple accent. Window treatment obviously can be able to improve the room’s value. This gold window curtains, for instance, succeed in adding another luxurious item in this living room which is dominated with white color scheme. 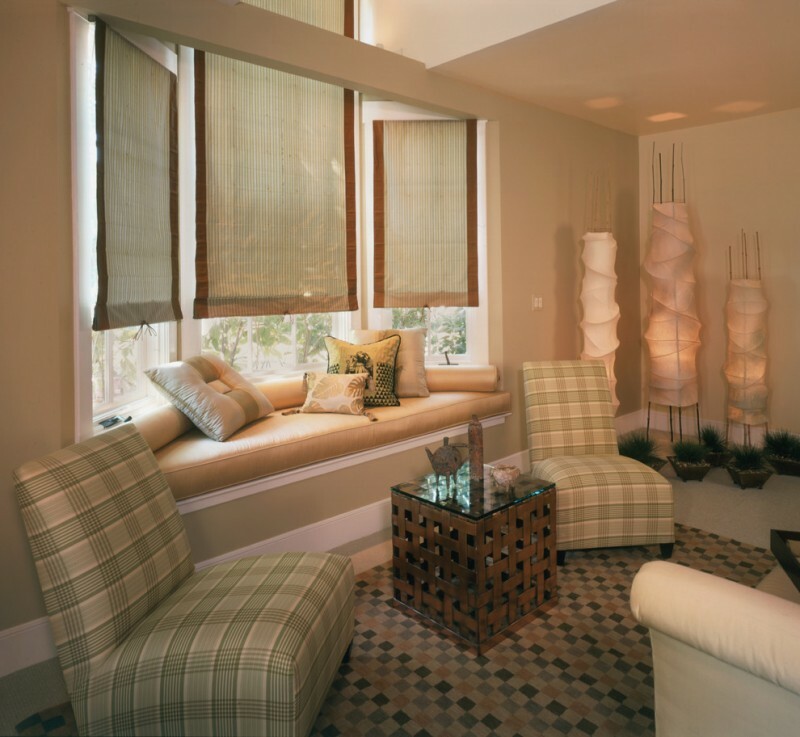 Create warm and cozy feeling just by adding something elegant like these half window blinds and curtains. 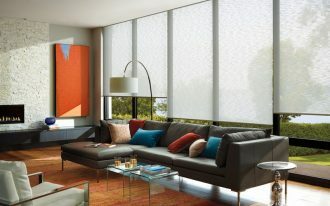 Both blinds and curtains are in similar tone and installed in one application. With this idea, it’s easier to execute the window treatment when we need the privacy or when we need to enjoy the view outside. What amazing day if we have such room in our lovely home. The room is furnished with a pair of wooden chair and round center table. Textured white rug here is added to create much more comfort, and yellow half curtains here are interior item that provides dual roles: functional window treatment and window accessory. 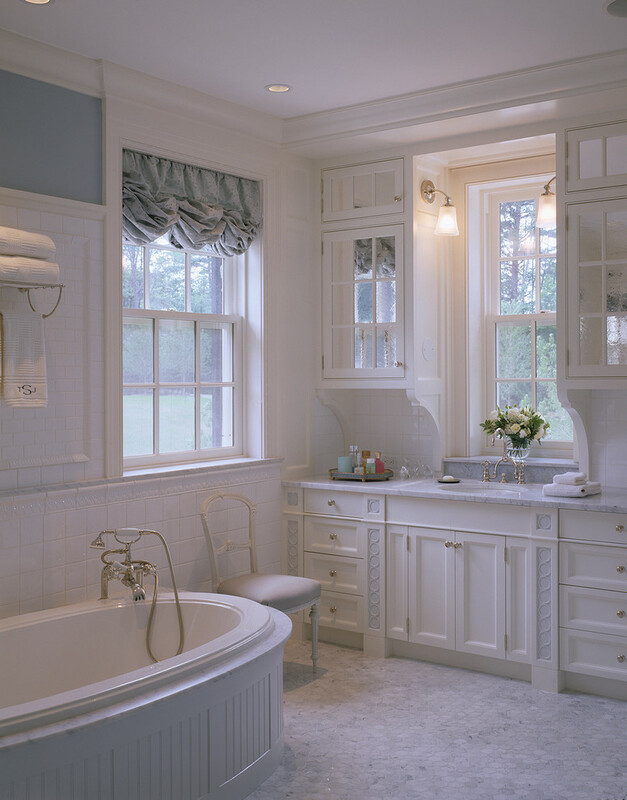 There is an easy solution to remodel a Victorian bathroom in order to be much more attractive and keep being elegant. Just add colorful butterflies motifs in your window curtains, the room will be more attractive. Such curtains idea also becomes another special accent after the black vanity table. 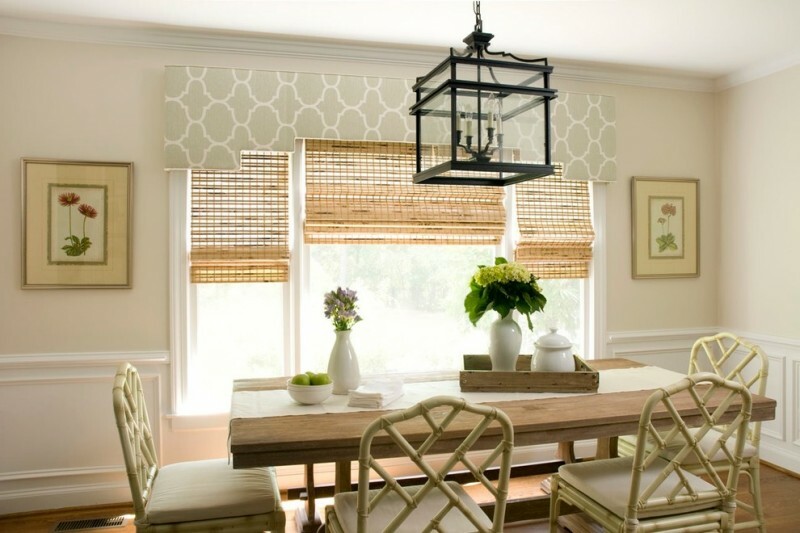 Original bamboo roll up window blinds effectively help us to create a natural and warm atmosphere in our breakfast room. It’s much cooler when this room is furnished with bamboo-made dining chairs and wooden dining table. It’s cute and sweet to decorate our baby’s bedroom with dominant pink and other soft color schemes like peach, soft beige, and white. This room, for example, uses beautiful peach half window curtain with decorative base as room’s ornament as well as functional window treatment. Generally, this room is so classic and elegant. It’s filled with luxurious Roman-style furniture set and decorated with beautiful Roman-style window curtain. This curtain is in grey and has decorative base. 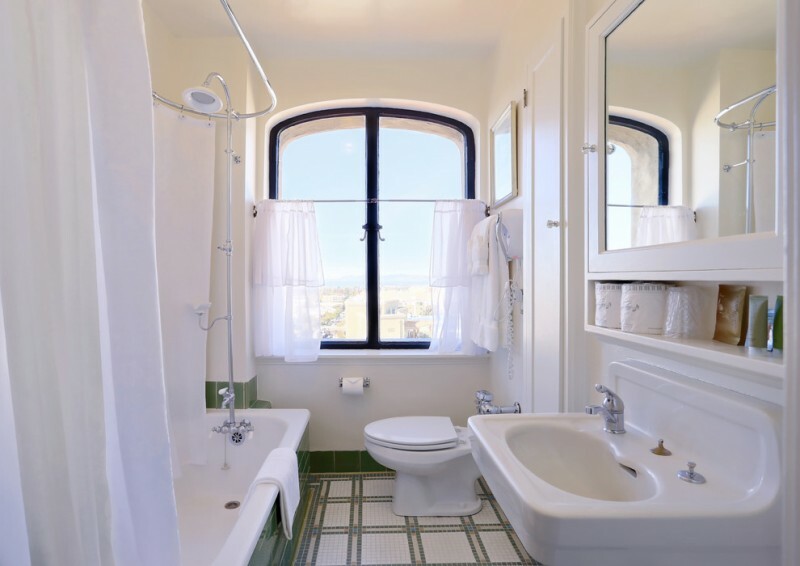 It will be nice if our bathroom is garnished with such beautiful window treatment. 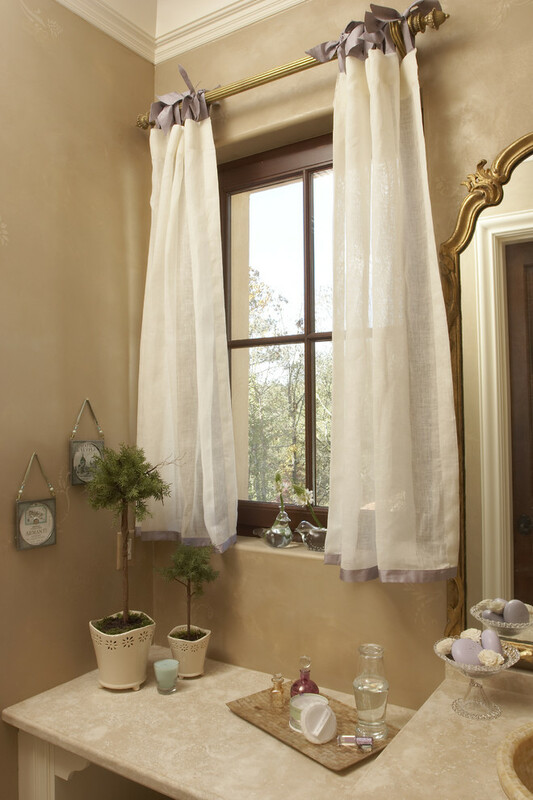 This bathroom, for instance, is beautified with grey half window curtain with decorative base. The curtain’s color of course has been fitted with the interior items which are all dominant in white. 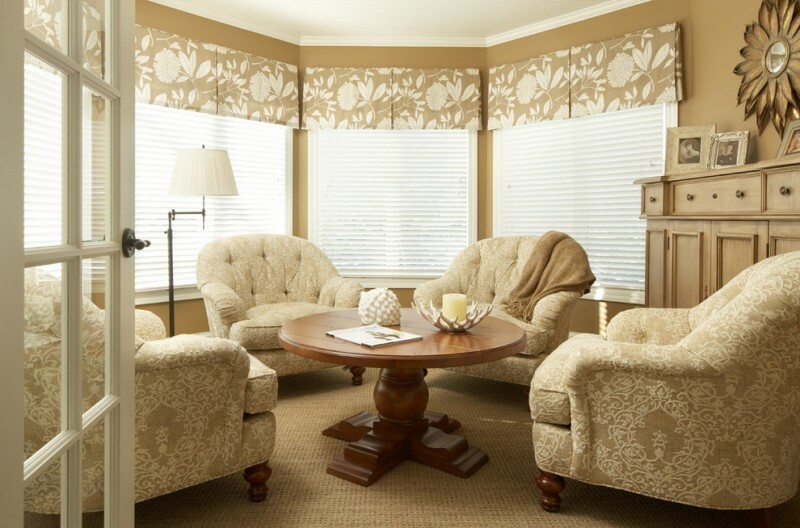 Based on theme, the curtains are designed with beautiful flower motifs. These motifs are made similar to bed linen, creating a harmonious scheme and motif in the bedroom. Such motif, actually, is so distinctive over the grand motif chosen by the designer. As we know, this bedroom is dominated with stripes motifs but different in color. But overall, both motifs are nice to be applied altogether. This bedroom idea is awesome. All room has turquoise as the primary color scheme. 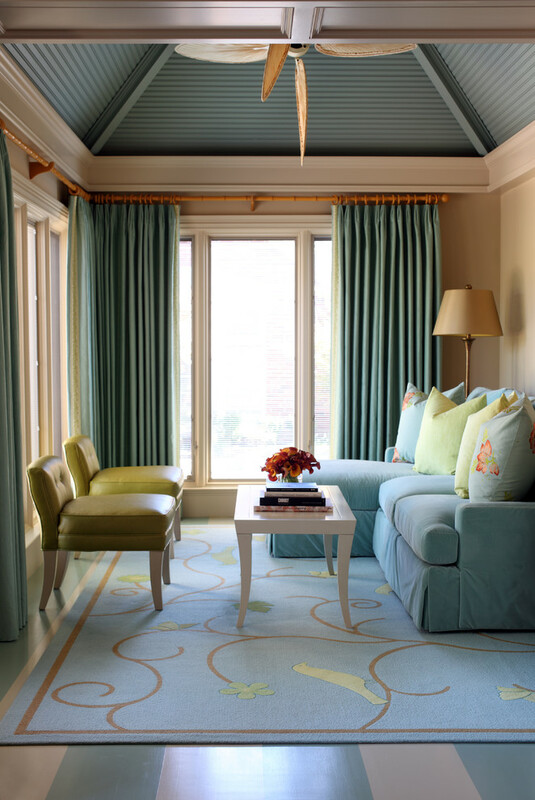 Take a look at the curtains; they are installed in half way and decorated with turquoise polka dots. 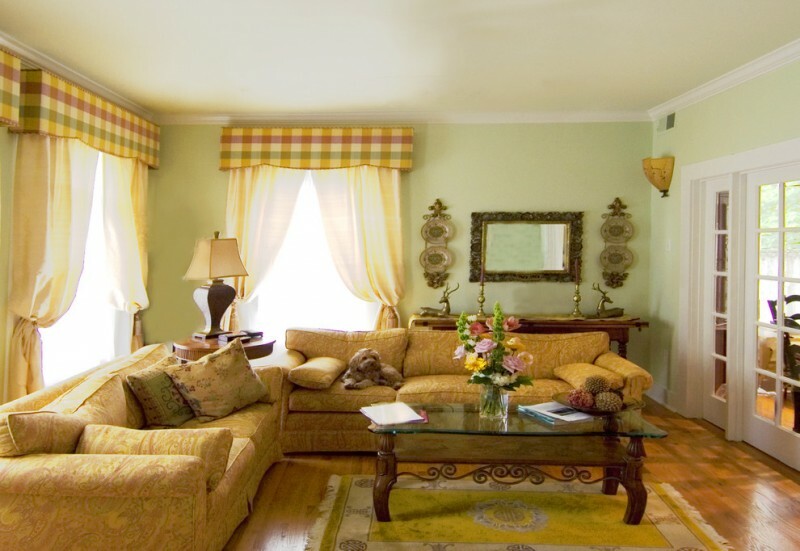 Such motif and color beautifully add aesthetic value for the curtains themselves. 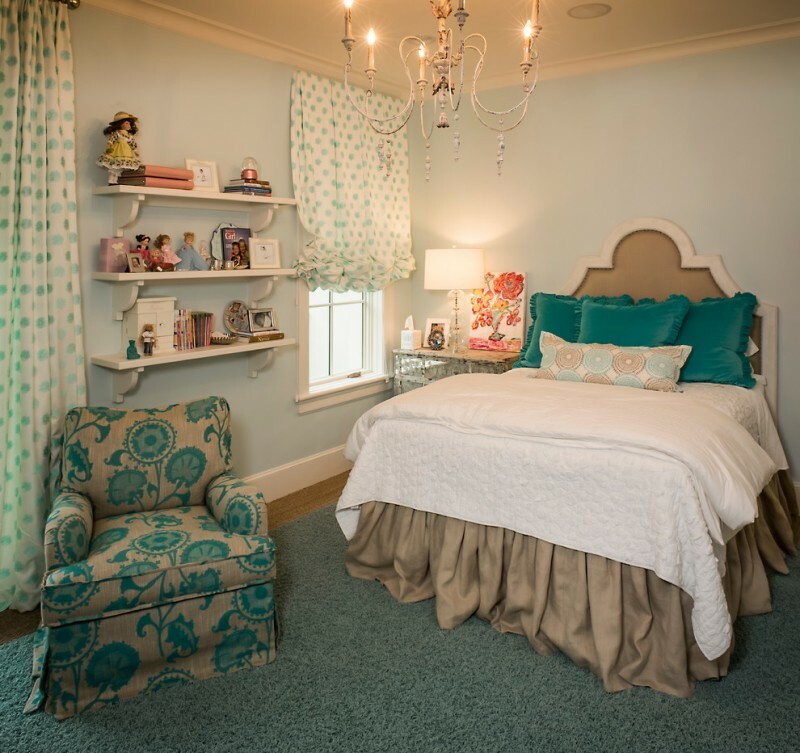 This girls’ room is also furnished with a cozy armchair with turquoise floral motifs, seagrass rug, and a bed with classic headboard. The designer plays with the richness of soft beige color scheme, texture, and pattern. It’s obvious to see the grand scale of soft beige color scheme which is implied on most of interior items, including a set of half window curtains. 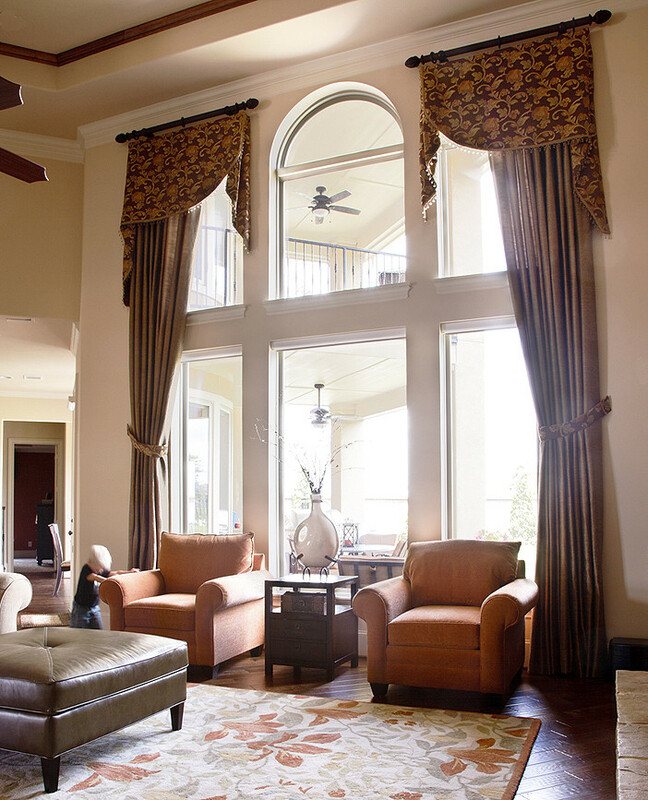 This sun room is designed in traditional style and dominantly uses soft beige as the grand tone. 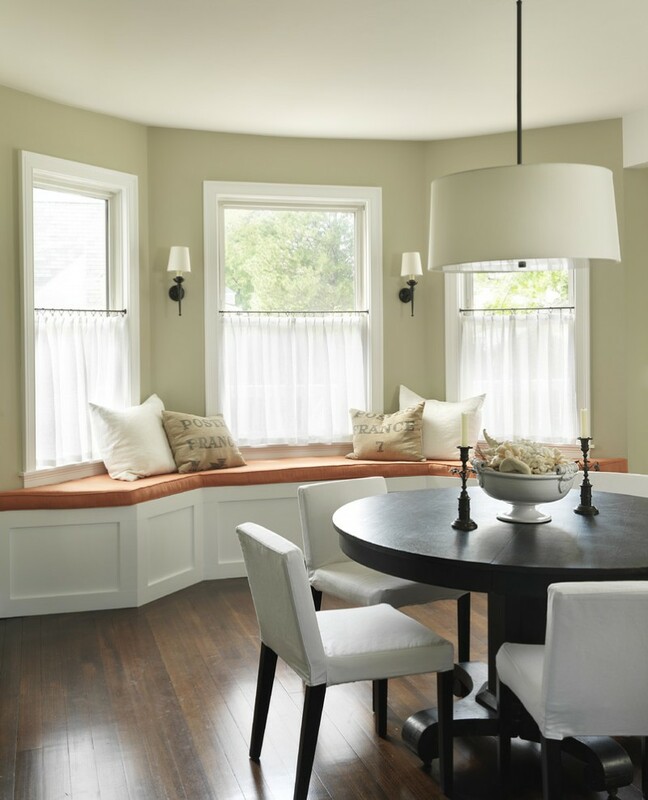 Interestingly, the owner selects to using two different types of window treatments: Valance-style half window curtains made of best fabrics and white window shades. To add much more beauty, the designer chooses white flower motifs as the curtains’ beautifier. This is another sample of cafe curtain application for modern bathroom. The curtains utilize black wrought iron rods as the hangers and beautify with simple black line at curtains’ base. 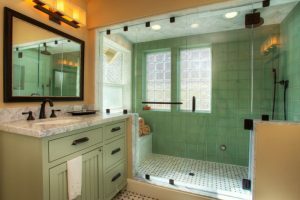 Importantly, the owner features them with several interior items covered with similar tone, like light yellow walls & floors, and tiles for shower’s backsplash. 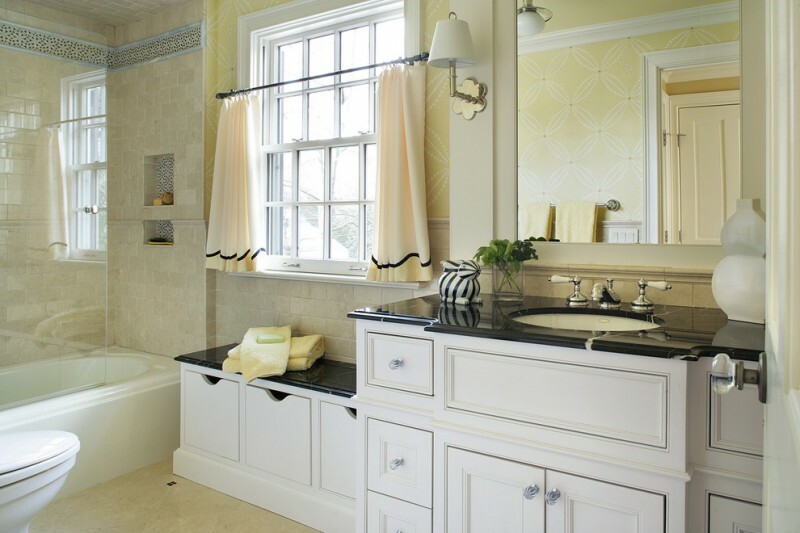 This combination is much more attractive after being collaborated with white bathroom fixtures and vanity. 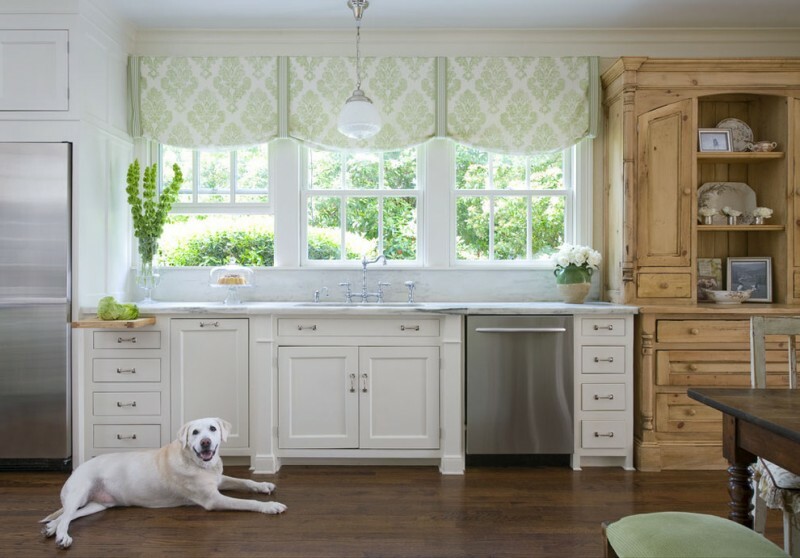 This kitchen equips chic white color as major color scheme. 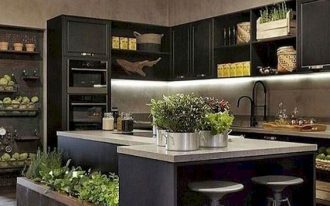 It can be seen from kitchen furnishing items like cabinetry and farmhouse sink which all are covered with white finish. To add another color scheme, the designer puts soft blue cafe curtains with multi-color motifs as the decorative & functional window treatment. 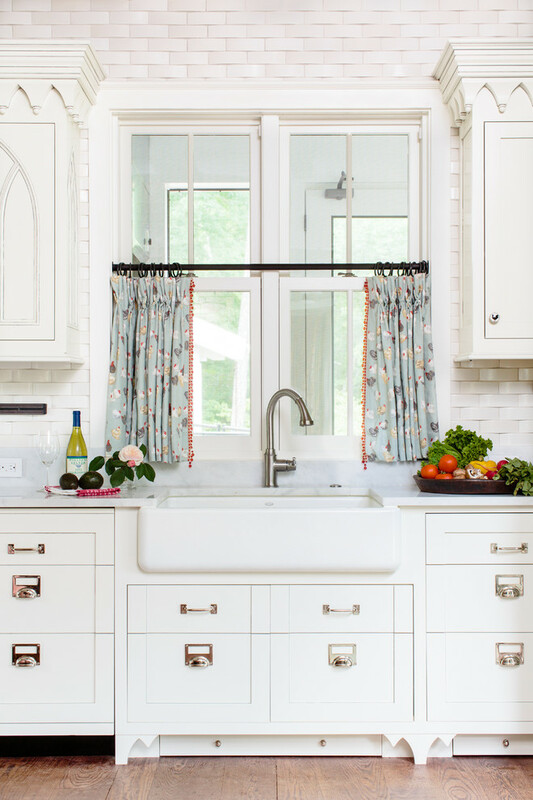 Attractively, these curtains give marvelous accent in this cooking space. It’s just simple; this sauna room has semi-transparent tier curtains in white, glass window with white diamond-shape trims, and cozy ottoman chair with soft beige slipcover. Different to other common bamboo curtains for windows, these curtains have thin & semi-transparent fabric covers addition. 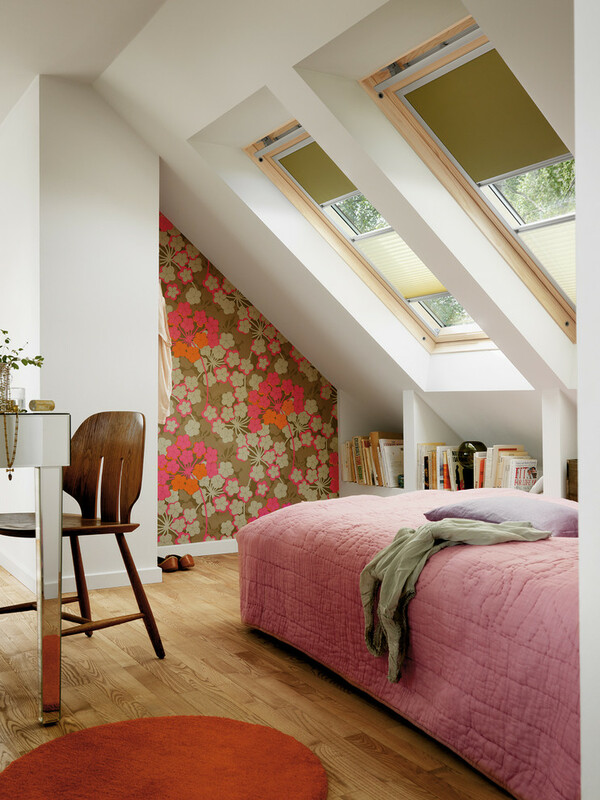 With these covers, the homeowner can freely set the curtains to get the best privacy and sufficiency of lights for room. White cafe curtain application which is featured with dominant wooden kitchen furniture result beautiful collaboration. The curtain offers a contrast accent for this room, especially in producing different color scheme. If we do a deep observation, this room has warm-feeling interior since it uses medium-toned wood finishes for interior facade. 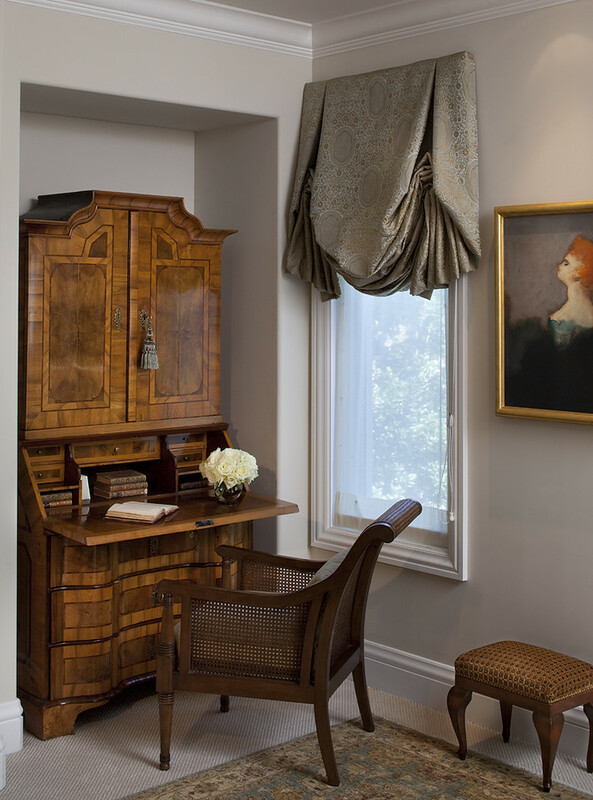 Wanna have an elegant and cozy home office? This idea may be your inspiration when you start to do your home office remodeling. This working space is completely furnished with luxurious and expensive office furniture. To make this space warmer, the owner feature the furniture with softer color schemed interior facade and little bit accent in the windows. 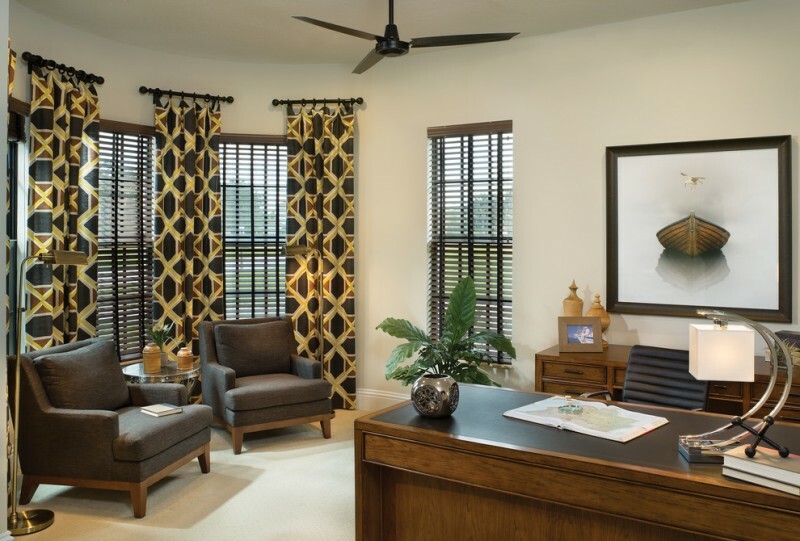 The accents are black window shutters and dark & gold toned curtains installed in a half way. A simple sun room design with cozy & chic interior items; the room is dominated by blue and little bit softer color schemes as the secondary tones. Like the curtains; they are installed from floor to ceiling and supported with bright orange rods. These two items, absolutely, create contrast but beautiful look. It’s so unique because the curtains are made of unused feedsack materials. They look so shabby but cool to be applied for. We can add more feedsack-made curtains just for accessories that cover our open shelves and other kitchen storage systems. This corner is simple but so inviting. 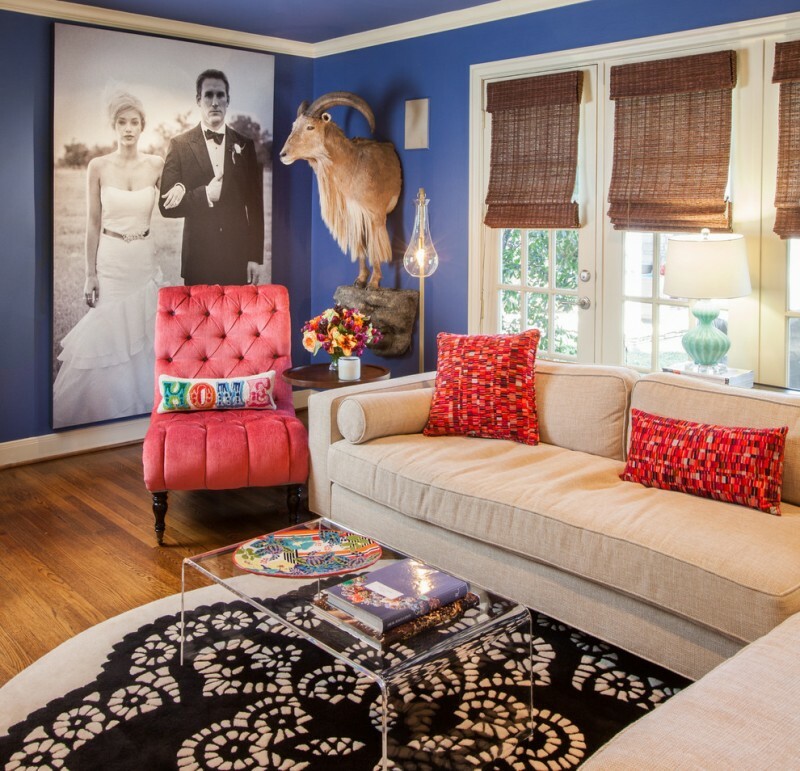 The room is designed in eclectic & vintage style. And the curtains optimally work well with such interior design. And surprisingly these curtains are just made of unused feedsack materials. That’s so creative, right? 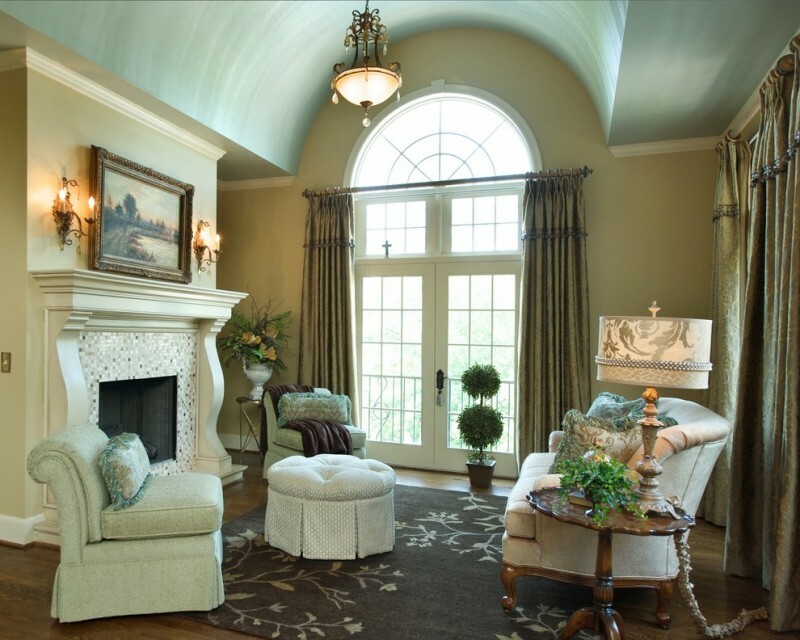 We all know that an arched window is difficult to treat. We have to be smart in selecting the best treatments for such window. Finials which are installed individually allow the easier treatment installation, especially in curve-shaped part of the window. The double layers cafe curtains; one layer is a net curtain and another is fabric-made curtain with flower motifs. Both complete each other, adding a special beautifier for the room itself. 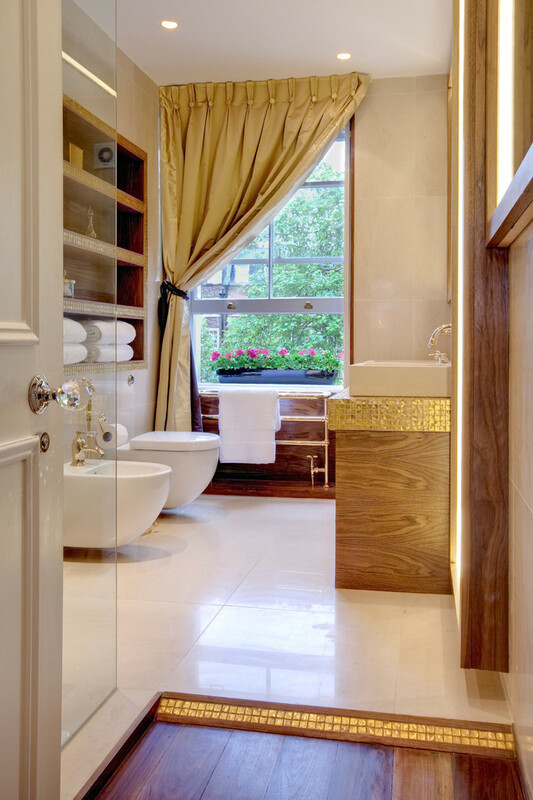 Semi-transparent tier curtains in white also add grand luxury in the bathroom. It will be more striking if they are collaborated with black-trimmed glass window and also white-dominant interior. It can be a unique idea if we mix two opposite styles into one concept of interior design. Like this living room; the designer collaborates East and West styles in which both are easily recognized from furniture choices. Let’s notice the curtains; they have produced in two different colors: deep and light brown colors, and they really fit for the windows and interior. ‘Plissee’ is an industrial window curtain originally produced in Germany. In this contemporary bedroom, there are two different tones of Slippee: light and deep ones, and both are applied to give little bit privacy and much of natural light. 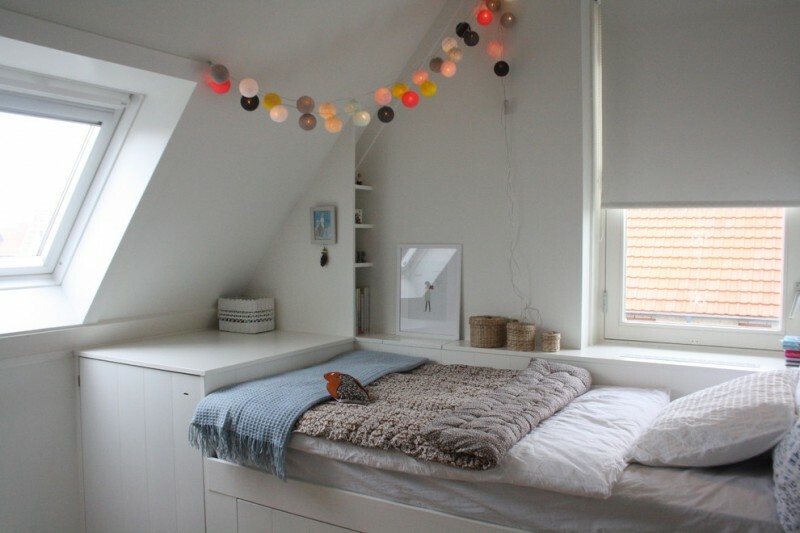 This attic bedroom is so awesome. The room has been furnished with an elegant white attic loft bed and supported with two large and stylish light providers: skylight & glass window. To create clean and modern look, all interior items are finished in white, including the window treatment. Get much more glam with such decoration idea. 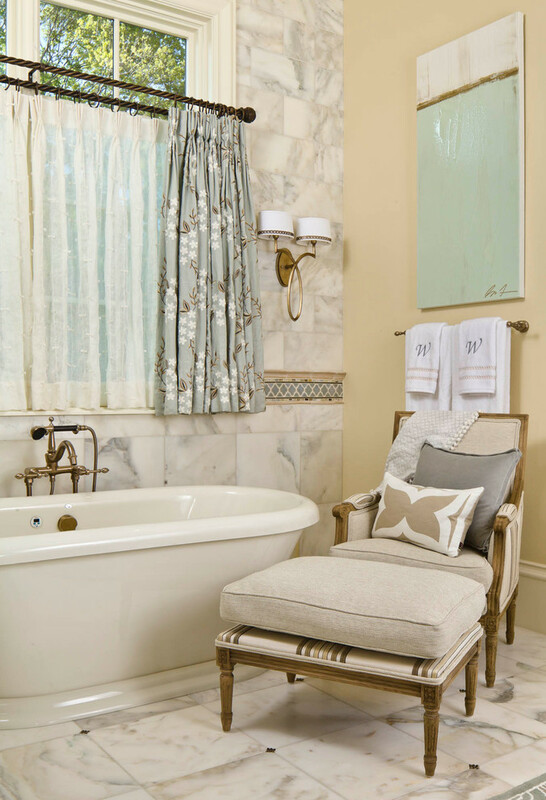 This bathroom is decorated with pale gold curtains, softening deep golden scheme applied on some spots like bathroom vanity, entrance way, and bathroom fixtures. These spots, as what we see, have glowing gold lines as the accents. Blinds and Curtains can be applied altogether in one frame of window. 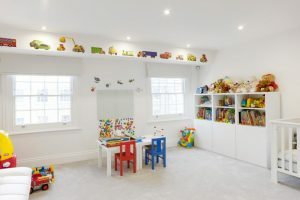 Like this one; the designer installs blinds and curtains in different motifs and color schemes, existing cheerful and eye-catching interior what most little girls want to. A cool room for relaxing and gathering with the lovely family; black, green, and white dominate this room. The curtains themselves are designed in two sides of surface: one has multi colors and motifs, and another is just green. This idea of curtain design is so unique and reversible to applied in any rooms. If you like polka dots, there are so many inspiring ideas of how to apply polka dots in your home. 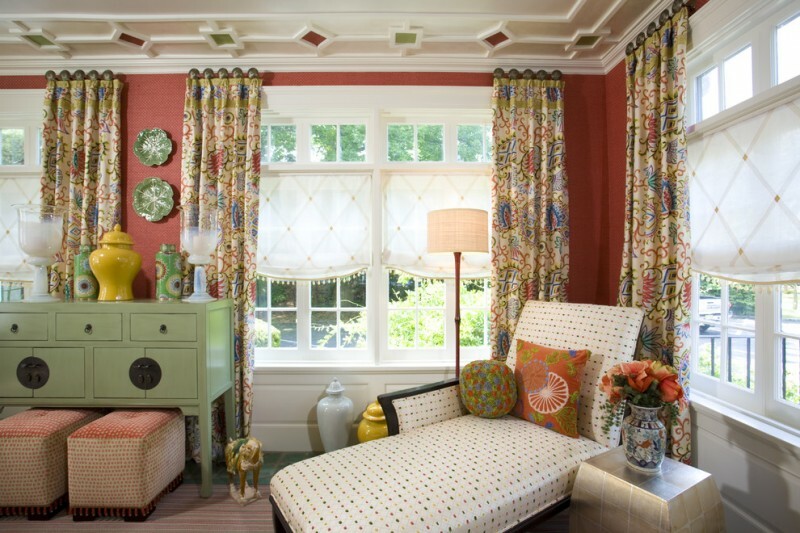 Like this room; red polka dots become interesting motifs for the curtains and they add more colors in this room. Red, the color used for polka dot motifs, is consciously selected to balance other red schemes which exist before. It’s actually easy to remodel our old living room into a vintage-style living room. Just replace some interior items with shabby but cool ones. 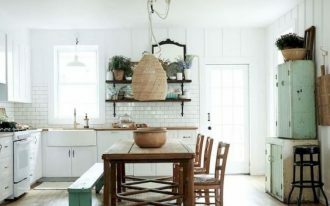 This room, for instance, just in instant has transformed into a stylish vintage living room after the owner adds white shabby curtains (installed in half way), white chair slipcovers, and bamboo window blinds. 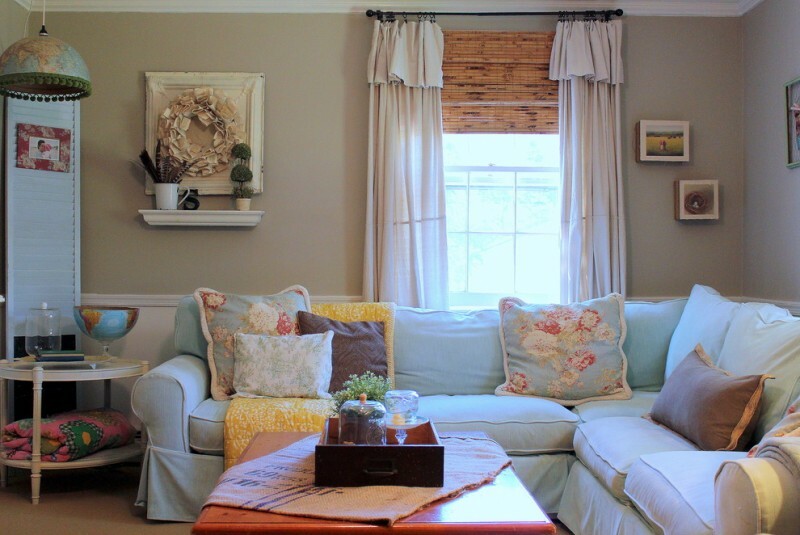 When the sun is brilliant to shine her sunlight over the whole parts of room, let’s soften it with these half curtains. The curtains have color gradation of white to yellow, and they are featured with multi-colors cornices made of best-quality fabric. Actually these curtains are similar to other white window curtains, but dissimilar in thickness of material used. They’re thinner than other common fabric-made curtains. If we observe carefully, these curtains also have longer ties, so they’re easier to tie up on the rods. 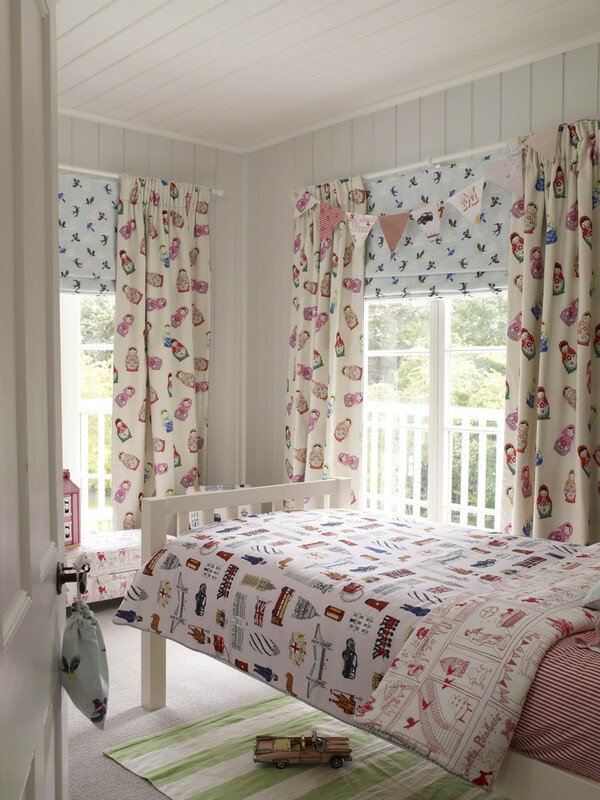 Scandi-patterned half curtains brilliantly work for such modern playroom or nursery room. 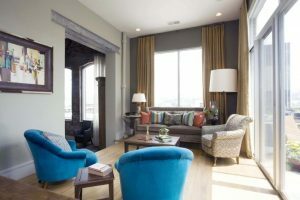 Be sure that the curtains choice always suits the other interior items, including the furniture, interior facade, and even the room’s accessory.